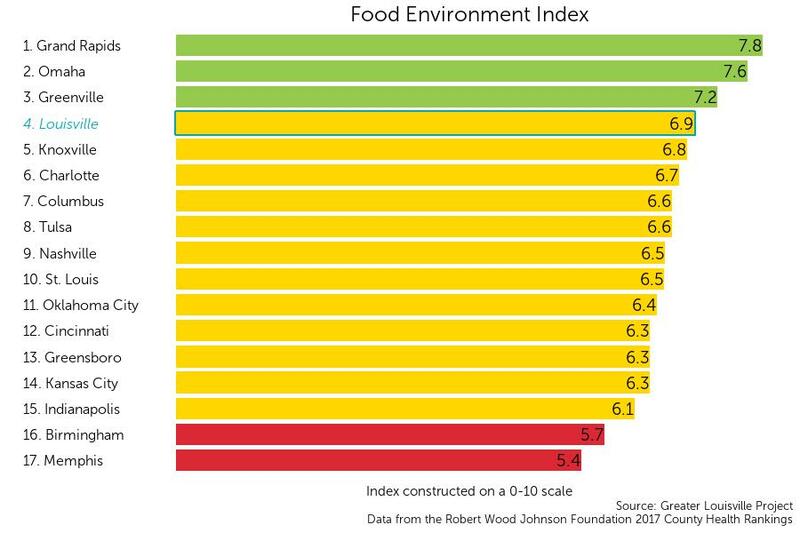 The food environment index is a metric that aggregates access to food within a reasonable distance and general access to healthy food options. Significant evidence has demonstrated the importance of healthy food choices in preventing negative health outcomes such as obesity and improving overall physical health performance. Louisville currently ranks 4th among its peer cities on the food environment index with z-score of 6.9. On this metric, Louisville is in the middle tier of its peer city group according to a natural breaks algorithm. Cities in green are those that outperform their peers, cities in yellow represent the middle cluster, and those in red are a group that lags behind its peers on this indicator.